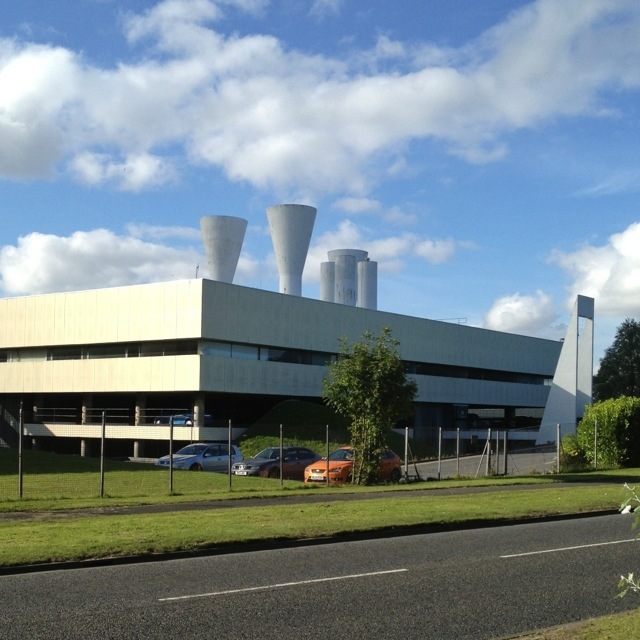 To make up the numbers following my failure to post a picture on Sunday, here’s one taken today of the former British Gas Engineering Research Centre and Mechanical Engineering Firm in Killingworth. The arch on the right of the photo adds a touch of drama to a small entrance bridge, while the roof exhibits three water storage tanks and three Venturi formed ventilation tubes. The building dates back to the days of Killingworth Township, which is an interesting example of a planned town. This intriguing old leaflet describes the Township, which connected residential towers to a carefully planned town centre via raised walkways, so that traffic and people never had to mix. Unfortunately, this also made life a bit claustrophobic, as well as generating a high-risk area for attacks and muggings: on high-rise walkways, there’s nowhere to run or hide if confronted. As a result of their damning unpopularity, the whole lot has now been flattened. But the impossibly futuristic Engineering Research Centre, attracted to the Township shortly after it was built, remains. This 1,841st post was filed under: Photo-a-day 2012, Killingworth, Newcastle-upon-Tyne. Trackback received at 17:40 on 9th October 2012.